Join SIMNA QLD on Wednesday, 29 August 2018 for an evening seminar and networking event in Noosa to connect funders and change-makers in the community. 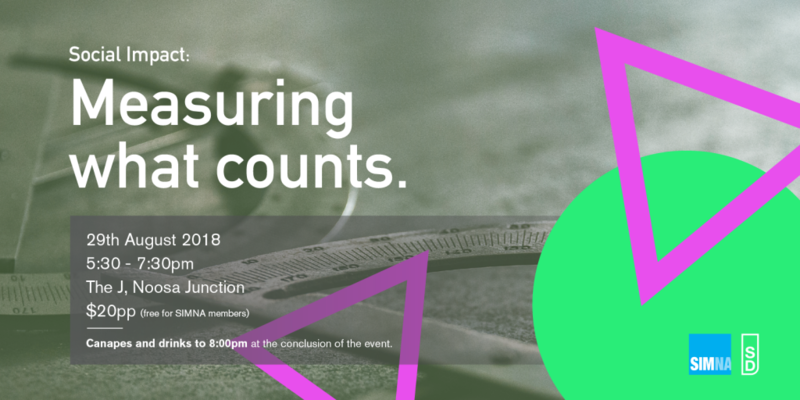 This event will bring together not-for-profits, social innovators, funders and anyone interested in investing for social good, to understand ‘what counts’ in impact measurement. It’s a great opportunity to learn about measuring social impact and share experiences of applying for funding or investment as well as understand what funders want in their applications. The evening will consist of three presentations on social impact measurement and impact investing/funding. The presentations will be followed by a panel discussion and Q&A. Networking nibbles and drinks will follow so that people from all sides of the ‘impact equation’ can discuss issues further following the presentations. This SIMNA event is proudly supported by The Social Deck.